OR a photocopy of your Discharge Recognition. The Honorable Discharge button or pin is authorized to Coast Guard personnel who are Honorable Discharged from the Active of Coast Guard Reserve, and WW2 era Merchant Marines who have been issued the USCG DD-214 for Honorable Service. Personnel who have completed an enlistment in the Coast Guard as part of their obligations shall be deemed qualified. 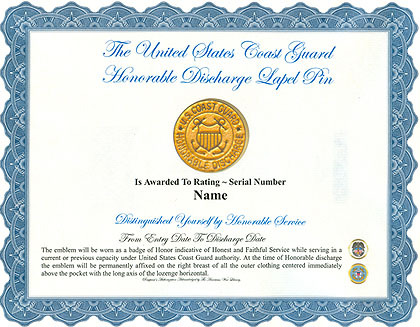 The Honorable discharge button or pin may be worn on civilian clothes only by eligible personnel, active or separated.